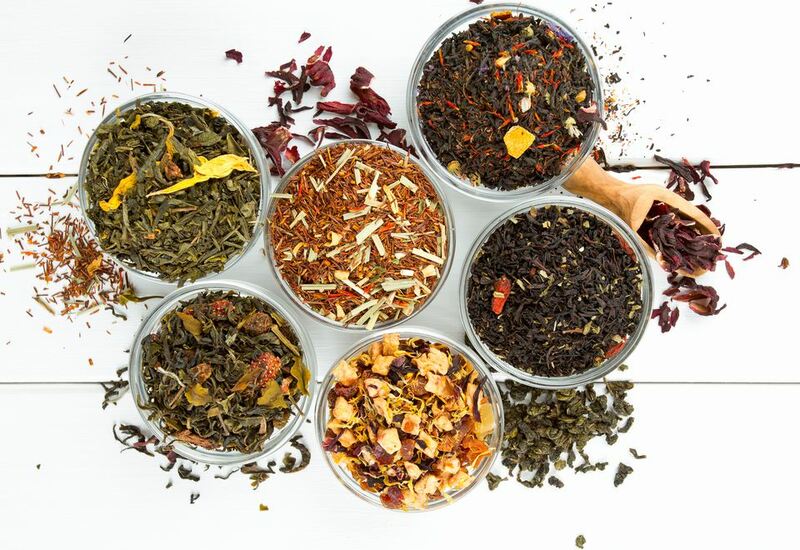 A variety of herbal tea blends are available for purchase, but very often these commercial blends use artificial flavorings and aren't the real thing at all. You can avoid this problem by making your own blends using natural herbs and flowers you have grown or collected yourself. Mixing your own herbs for tea is as easy as choosing the scents that appeal to you and blending up your favorite choices. In summer, you may prefer a delicious iced tea, while winter may see you brewing a nice warm tea to ward off the chill. After mixing up your favorite blend of herb tea, keep it in a glass jar in a dark place. Use at least one teaspoon of dried herbs per cup of water, more to taste. Experiment a little and come up with your own variations to call your own—you can create specialty blends for different purposes, and give them away as personal gifts. While the field is wide open for whatever herbs you want to try, most good herbal tea blends follow a structure to provide a range of tastes. Flowering notes. The basic blend includes flowery notes of some sort. Common options include violet flowers, chamomile flowers, dandelion petals, calendula petals, or wild rose petals. Add one part of this herb. Placeholder flavor. After adding the flowers (fresh or dried), add a place-holding flavor. This will be the flavor that ties everything together and keeps an iced tea tasting strong enough to withstand a few ice cubes melting into it. Dried red raspberry leaves or dried nettles work well here. Add two parts of these herbs. Fruity component. Next, a fruity or naturally sweet component is nice. Dried rosehips is a common choice here. These are sold in many herb shops or health food stores if you have not harvested your own. Another option here is hibiscus flowers, which are not only sweet and lemony flavored but also impart a rich, red color to your teas. Add one part of these herbs. Cooling herb. Especially for summer iced tea, a cooling herb is an ideal final ingredient. Mint is usually most common here. You can add any combination or variety of available mint herbs you have. Another naturally cooing herb that works well to round out your blend is borage—the leaves or flowers (or both) can be used. Add one part cooling herbs to finish your recipe. ImmuniTea. This is a recipe borrowed from Real Food Outlaws. It uses classic immune-boosting ingredients that are rich in antioxidants and vitamins. It makes a great hot tea for the winter colds-and-flu season. Simply mix all the herbs together and store in an airtight container. To brew, use a tea ball to steep 1 teaspoon of tea blend in hot water for 20 minutes. Tranquil Tea. This one comes from the Bulk Food Store, and contains ingredients chosen to relax and calm you. Combine the herbs in a glass jar and shake to mix. To use, add 1 teaspoon of tea mix for each serving to a tea ball or strainer and steep by covering with boiling water for 5 to 10 minutes. If you wish, you can add a touch of honey for sweetness. Pour 1 cup of boiling water over the tea mixture, cover and steep for 5 minutes before drinking.